"The Ultimate! Diminished Scale Coloring Book” is to date, the most comprehensive exploration and presentation of one of the staple elements of the contemporary improviser’s toolbox - the octatonic Diminished Scale. The roughly 350 pages of musical examples contained within represent not only the traditional view of this colorful and mysterious symmetric scale, but also its less explored native pentatonic, hexatonic, as well as its various three and four note derivations. device. Set on a music stand, and the need for scrolling is kept to a minimum. As with Vol. 1 & 2 of “Slick Licks That Stick!”, each of the examples is built from all 12 steps of the chromatic scale; and while the instrumental range for these exercises is that of the Bb Tenor Saxophone, it can easily be adapted to suit any instrument and level of ability. Liberal use of enharmonic spellings is used throughout. 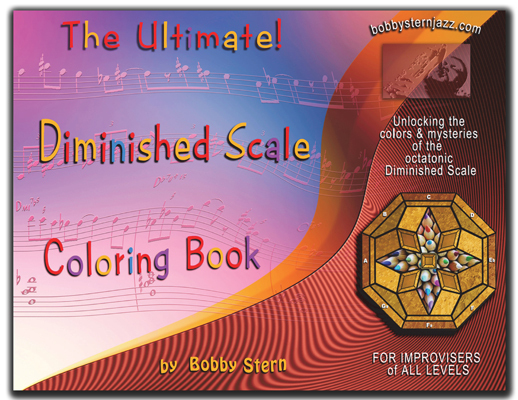 Here, you'll discover that “diminished” is not the only color in the Diminished Scale’s palette!